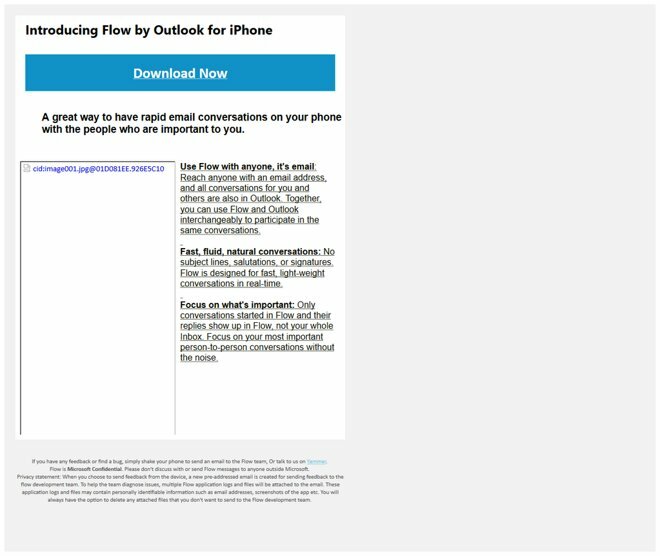 Microsoft appears to be developing a streamlined chat and email application for iPhones called Flow by Outlook, a leaked download webpage marked "Microsoft Confidential" revealed on Wednesday. The page was discovered by a Twitter user known as @h0x0d, and describes the app as a "great way to have rapid email conversations on your phone with the people who are important to you." Users can reach anyone with an email address, the page adds, and conversations started in Flow can be continued in Outlook. The main difference with Flow is that salutations, signatures, and even subject lines are dropped, turning conversations into something akin to instant messaging. The app also hides any email exchanges not started in Flow. A Microsoft spokesperson told ZDNet that the company had nothing to share about the app. The comment may have indirectly confirmed the app's existence, but there's no indication of when Flow might become available or even what it will look like. Microsoft already has an iOS version of Outlook, but the company has been releasing an assortment of small-scale Office iOS apps for different tasks. Flow could be an answer to the popularity of lightweight email apps like Google Inbox.